One must work long and hard to arrive at the truthful. What I want and set as my goal is damned difficult, and yet I don’t believe I’m aiming too high. I want to make drawings that move some people … Whether in figures or in landscapes, I would like to express not something sentimentally melancholic but deep sorrow. In short, I want to reach the point where people say of my work, that man feels deeply, and that man feels subtly. Throughout his life, art has been there, but its importance for Aghyad al-Atassi has changed as his situation has changed. 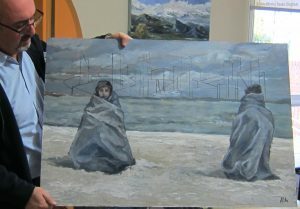 His powerful paintings are testimony to resilience and the power of art to express emotion. Aghyad’s home in St Albans, Melbourne, is like a gallery of his work, with paintings of all kinds hanging on all the walls, in all the rooms. 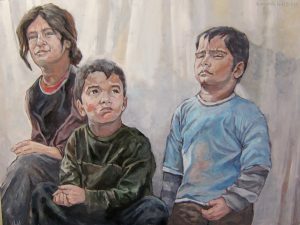 There are small colourful still lifes of everyday objects, landscapes of Syria, imaginative scenes, and portraits of Syrians affected by the war. Even so, Aghyad claims he isn’t an artist, only a self-taught art student who is learning. He’s very modest. Aghyad’s hometown is Homs, where he worked as a dental technician. As a child his parents recognized his talent for art and encouraged him to paint, but he lost interest in his teens, studying Mechanical Engineering for three years, before changing to something more creative – graduating as a dental technician. It wasn’t until later that he started making art again, following an interest in architecture, and drawing careful intricate mosaic designs, which he manipulated digitally. Then the conflict started, and at the same time his art changed. He found he needed a more visceral, energetic way of making art, a way that helped him to get rid of the stress and anger he was feeling. “It was therapy for me”, he said. “It helped release my feelings”. He started painting again, using acrylic paint and soft pastel to make vigorous marks with a brush and palette knife, painting the destructive forces around him. Aghyad left Syria with his family and moved to Turkey for 18 months, before arriving in Melbourne two years ago. They rented a house in Sunshine that was attached to a garage, and it was here that Aghyad painted whenever he needed to de-stress and deal with his emotions. 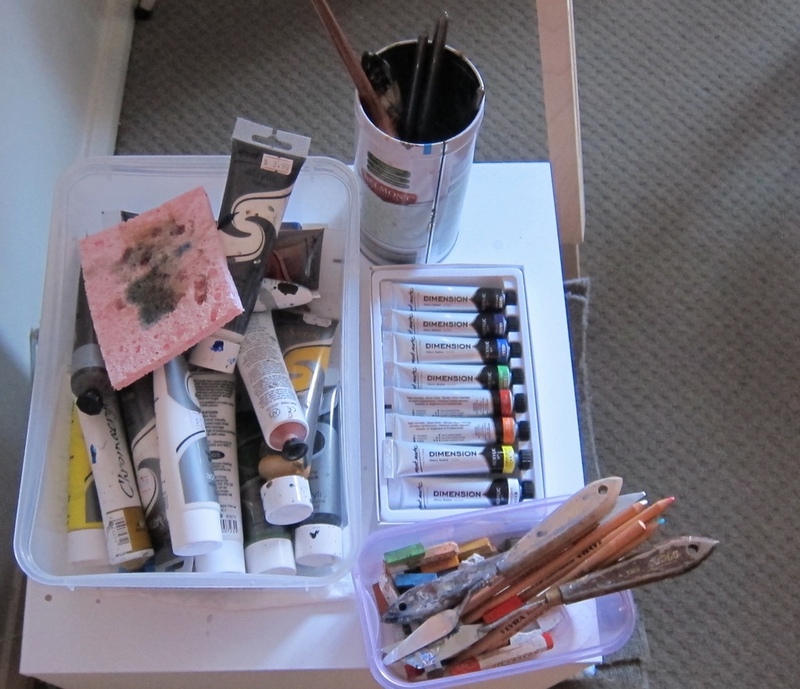 This resulted in 40 canvases painted in a year. 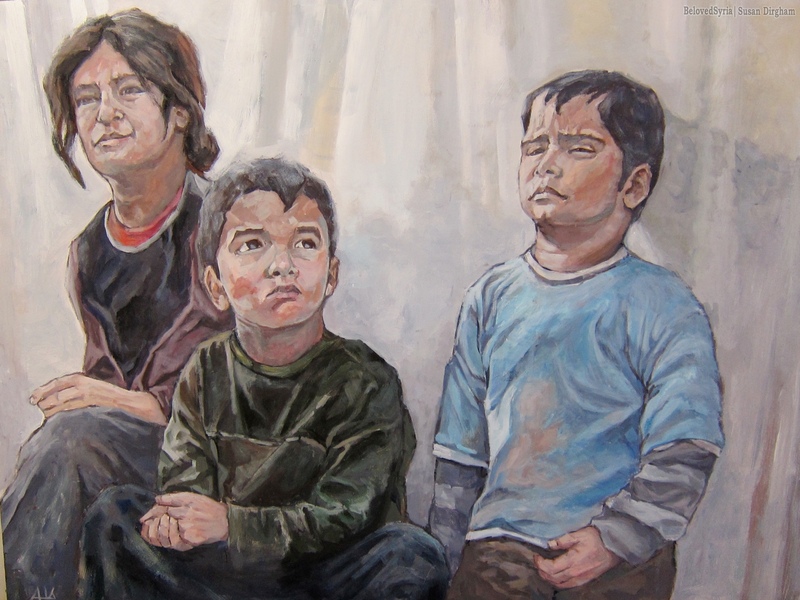 He feels that paintings and images are more effective than words to express emotion, and this is clearly true in his powerful portraits of Syrian refugees. We see groups of people travelling at night, tired streams of people walking, families waiting. The colours are soft and subdued, expressing a deep sadness with the figures surrounded by an agitated sky and landscape. Most of these works come from images in his memory, but for the details of faces he refers to photographs found on the Internet. Aghyad takes inspiration from a number of artists, from Modigliani, Munch, Cezanne, but especially Van Gogh whom he says is ‘the best one’. 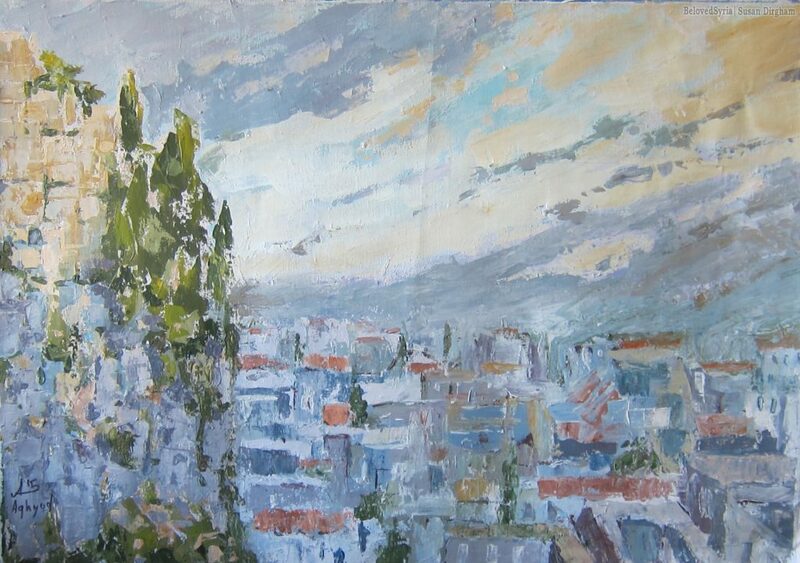 The paintings he made while living in Turkey show clearly these influences, such as his painting of the citadel in Homs. There are similar clear colours using a brush, but also a palette knife and fingers to make marks. He doesn’t draw first, but begins with the darker areas or shadows, adding more colour later, and then finally using soft pastel. “I don’t like following rules” he says, so he is willing to try all ways to learn and to say what he wants. Aghyad showed me where he paints, in a small spare bedroom, with his easel, an easy chair, his paint tubes, pastels, brushes and knives. He keeps the blind down and has a strong lamp so the light is constant whenever he works. Nowadays, the practicalities of life mean that he often has to work at night, as he’s busy retraining as a dental technician. “He just goes for it,” his wife Salam says. I was privileged to see many of Aghyad’s paintings. I asked which one was a favourite, and he pointed to one of a huddle of refugees walking, half visible with their faces covered, in a dusty landscape. He showed another favourite, one of Williamstown with the view of the distant city across the bay. The choppy sea looks like a barrier with a number of fishing boats offshore, like those used by refugees. 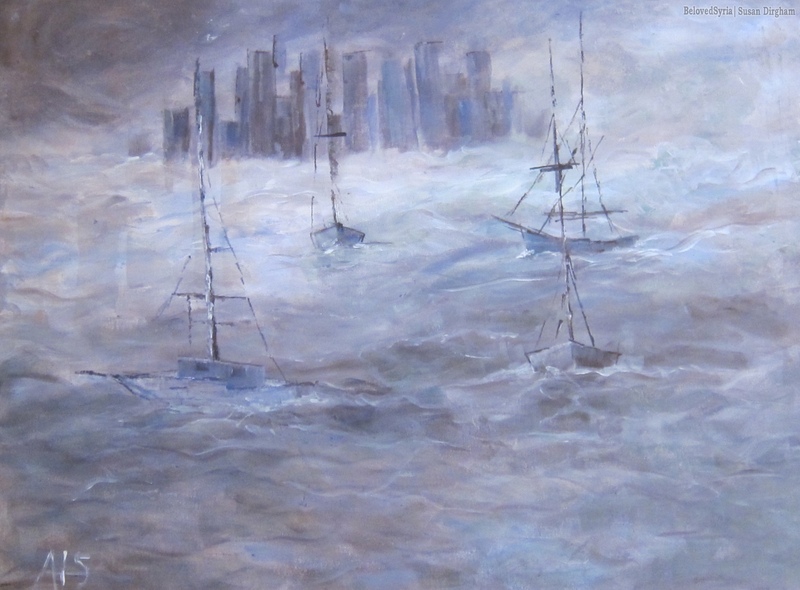 The city looks far, unobtainable across the sea. 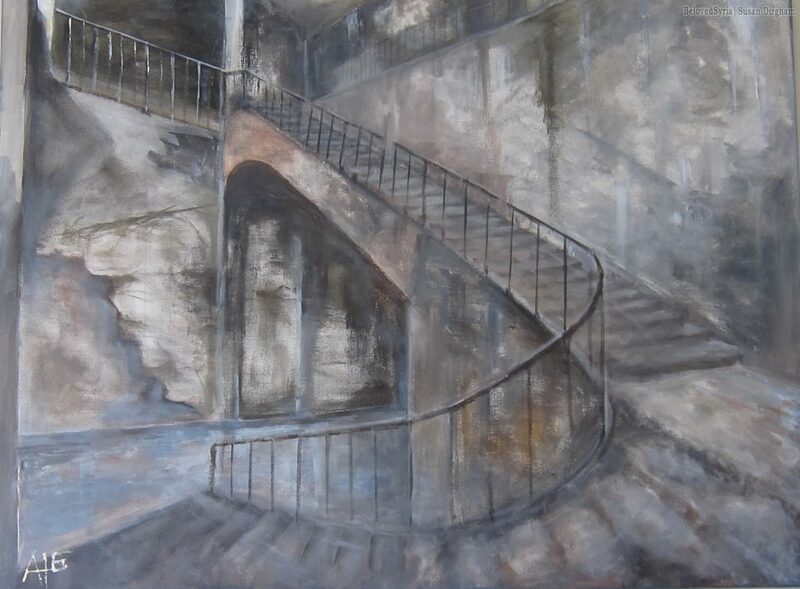 A painting from his imagination is a staircase that can leads upwards, or down to an unseen corridor. I asked Aghyad which way he was going in the painting. “Down,” he said, although what’s in the corridor he does not know. But in the future he will continue painting, with an exhibition of his work planned for next year at Yering Station in the Yarra Valley. In the meantime he keeps painting powerful work, expressing his feelings while developing and learning new techniques.